Southwestern Energy, Working H Meats & Market, Get Fit Juices and Shakes and More Coming!! MORGANTOWN — An energy company regional office, a butcher shop and more are coming as part of the increasing growth of Fort Pierpont, currently home to Planet Fitness, Fox’s Pizza and Mon Health Wedgewood Primary Care among others. The businesses will fill a “pent up demand” for services close to Cheat Lake, according to Chris Wilbert, associate with Premier Commercial Real Estate. Working H Meats and Market has been selling its goods at the Morgantown farmer’s market for 10 years, owner Terri Hardesty said. She said customers have been asking for a shop in Morgantown and in January, Hardesty will open a permanent Working H Meats location in Fort Pierpont. The family-owned business initially worked from a farm before opening a store in Friendsville, MD, four years ago. Working H Meats sells beef, pork, lamb, goat, chicken, turkey, trout and rabbit, Hardesty said. All products are from local farmers in Garrett, Preston, Alleghany or Monongalia Counties, she said. The butcher shop also sells smoked goods such as kielbasa, ham and bacon. “It will be a huge hit,” Wilbert said. Hardesty said part of the reason she decided to locate the second shop in Fort Pierpont is the developments convenient access to the interstate. “Traffic doesn’t seem as bad as downtown,” she said. Southwestern Energy is also relocating its regional office to Fort Pierpont, Wilbert said. The office will have 70-80 people working out of the development every day, he said. Those employees will be able to grab a healthy snack at Get Fit Juices and Shakes, which should open around the same time as Working H, Wilbert said. In the next few months announcements about a locally owned restaurant and a national retailer should be coming, Wilbert said. He said construction of a second building with over 10,000 square feet, capable of holding about 12 more businesses, should start in spring. Cheat Lake has a lot to offer retailers – such as a growing population, high average income and demand for businesses so residents don’t need to travel all the way across town to fill their shopping needs, Wilbert said. 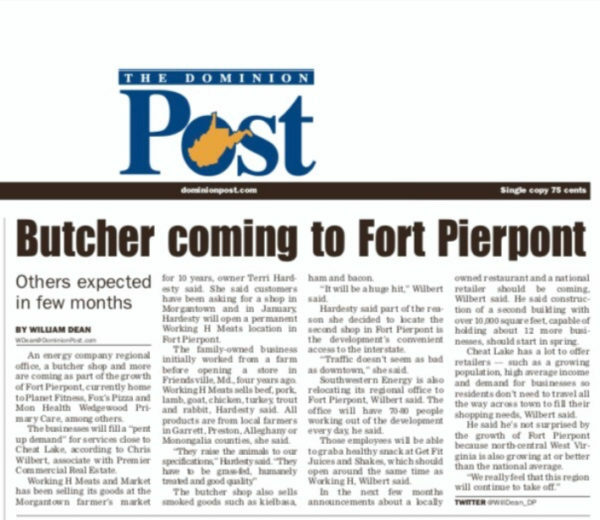 He said he’s not surprised by the growth of Fort Pierpont because north-central West Virginia is also growing at or better than the national average.